I spent the most amazing weekend at Gray Barns on the Silvermine River, a beautiful Inn in Norwalk, Connecticut. I could write a full post about visiting the Glass House, shopping in New Canaan, a walk through Grace Farms, antiquing in Stamford, wine tasting at the Wine Connection and dinner at the Tavern. But for now, I'm just going to talk about the most amazing scent that was in the lobby of the Inn. 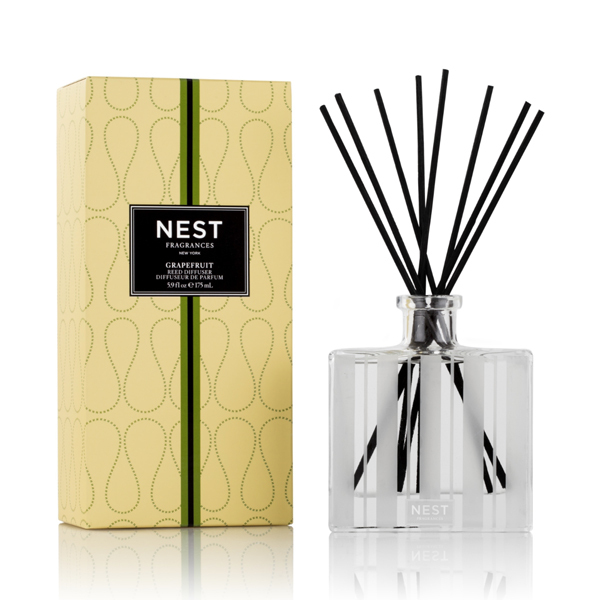 It's from Nest Fragrances and if you like citrus, I would stock up on this before it sells out. It's no secret that moms just want a little time to themselves occasionally. What I want for Mother's Day? A slow morning (preferably in this robe which happens to be 20% off with code WOWMOM), a fun afternoon with my boys and a nice family dinner. 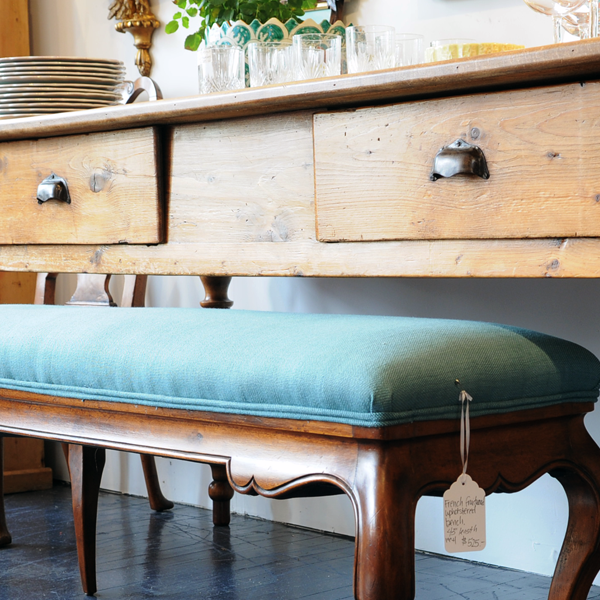 I am wrapping up multiple entryway projects at the moment and I'd love to use this French Farmhouse Table and Bench in one of them. I often try to find vintage or antique statement pieces for spaces I design. Unique, one-of-a-kind items may even be comparable in price to furniture you'd find in a big box store and much better quality! Contact the lovely owner Deborah directly for details. This gentle soap is made by hand by a lovely woman right here in my new hometown of Stonington, Connecticut and infused with the healing properties of the sea. It's biodegradable and made with seawater, extra virgin olive oil and lavender essential oil. And it just so happens to be available at my favorite little shop in Mystic - Salt Mystic. There are so many things I love about this rug, I don't even know where to begin. It's got amazing texture, a little bit of shimmer and sueded leather all woven into a neutral rug perfect for almost any room. I have always loved abstract art. One of my favorite artists working today is Emily Jeffords, an abstract impressionistic painter from South Carolina. She's hugely popular and you may have seen her all over Pinterest. Her work is ethereal and beautiful. I'm sure there are originals somewhere but as far as I can tell they're all sold out. She also sells framed, fine art canvas prints in her online shop in many different sizes. I'd grab one while you can! These vintage archery arrows are straight out of Wes Anderson's Moonrise Kingdom. I love the idea of using unexpected items for wall art and I think hanging them in a kid's room or rec room would be adorable. Just make sure the littles can't reach them. I think every room should have a basket. Every. Room. And this basket is beautiful and practical. It's got a great rustic quality, but then it's dipped in pink and metallic gold for the right amount of girly shazam! I could totally see it in a nursery or a little girl's room. I have been CRUSHING on these Injiri pillows ever since I found them on Amber Interiors' Instagram feed awhile back. And wouldn't you know, she sells them too. They're so simple and charming and add just the right amount of whimsy. And who couldn't use a little whimsy in their life? I try to be grateful for what I have at any given moment. But I have to admit there are times when I'm seriously "lusting" after something…and it's usually for my home. Case in point: this bowl from Jill Rosenwald. Even her description is dreamy: "Imagine yourself surrounded by blue skies & turquoise water & that Florida sunshine."